DjangoCMS offers a Clipboard where one can copy or cut and add a subtree of plugins to the DOM. This Clipboard is very handy when copying plugins from one placeholder to another one, or to another CMS page. In version 0.7.2 djangocms-cascade extended the functionality of this clipboard, so that the content of the CMS clipboard can be persited to – and restored from the database. This allows the site-administrator to prepare a toolset of plugin-trees, which can be inserted anywhere at any time. In the context menu of a CMS plugin, use Cut or Copy to move a plugin together with its children to the CMS clipboard. In Edit Mode this clipboard is available from the primary menu item within the CMS toolbar. From this clipboard, the copy plugins can be dragged and dropped to any CMS placeholder which is allowed to accept the root node. Since the content of the clipboard is overridden by every operation which cuts or copies a tree of plugins, djangocms-cascade offers some functionality to persist the clipboard’s content. To do this, locate Persited Clipboard Content in Django’s administration backend. The Identifier field is used to give a unique name to the persited clipboard entity. The Save button fetches the content from the CMS clipboard and persists it. 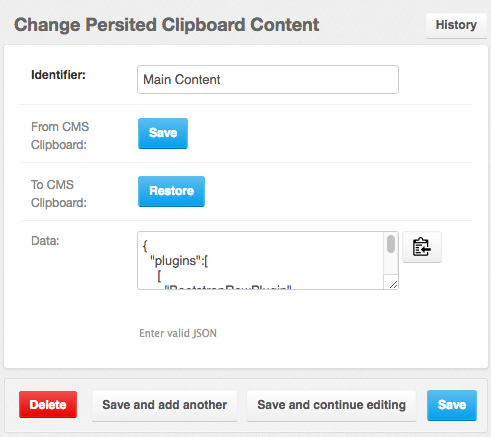 The Restore button replaces the content of the CMS clipboard with the current persisted entity. This is the opposite operation of Save. Since the clipboard content is serialized using JSON, the site administrator can grab and paste it into another site using djangocms-cascade, if persisting clipboards are enabled. Only CMS plugins from the Cascade eco-system are eligible to be used for persisting. This is because they already use a JSON representation of their content. The only exception is the TextPlugin, since djangocms-cascade added some serialization code.